An insight indicates what should be done differently to achieve our outcome. It’s relevant, has practical implications, and can change our budgets, methods, policies, or organizational structures. Insights are not like mathematical equations. Different people will make different kinds of connections and will refine insights from stakeholder advice in diversified ways. Focus on the “how.” An insight tells us how to achieve an outcome that we defined when we started the project. It doesn’t redefine the outcome. Insights are NOT obvious. Try to find new, relevant connections between answers, which reflect a strategic change. It’s possible to have conflicting insights. If two interpretations contradict each other, insights can reflect their opposing rationales instead of mediating between them. Insights inspire decisions. A good insight is written in a way that empowers decision-makers to allocate resources or regulate activities. Suggests clear direction of action, which can be translated into decisions and is based on the advice received. Contains general statements without clear rationale or an innovative approach to decision-making. Change in public service requires more than just new networking among like-minded officials. We should create new content and mentor the right leaders in order to help them generate real change in the right direction. To attract more people into our community, we need to open our events and invite more people to attend. As of now, meetings take place at different times and locations, and they do not convey a sense of openness. Employees’ professional development does not require external courses, but rather, can occur from the use of internal resources. Inner-departmental engagement and TED Talks can generate results with relatively low cost. Community development requires additional public gatherings in public spaces. While many officials manage and supervise public buildings, no one promotes events in the open areas, where citizens and families can meet each other. Integration of the Ethiopian community requires a radical shift from the current “separate & support” approach. If support is given only to Ethiopians, separation will persist without integration. Participants highlight key points in answers that reflect a certain direction for action. Participants group highlights in which a similar direction for action can be found. A new insight is written to reflect a group of highlights with a similar direction. The participants are asked to do the entire analysis. The participants do most of the analysis, but admins approve the insights. All answers and insights require admin approval before publication. Who links highlights to insights? Who can create a new insight? Who approves a new insight? How many users are needed to suspend an answer? How many users are needed to approve an answer? How many users are needed to approve an insight? Your Insights website was designed to enable project admins and participants to perform very simple analytical tasks, as a way to turn answers into insights. There are four interfaces in which the website will ask users to take action. After adding an answer: The website enables users to analyze their answers. After an answer is added, participants will be asked to highlight the key ideas within the answer. If insights are approved, participants will be able to link their answer with one of the insights. Task interface: This interface enables participants to process the answers of other participants. For example, if there are answers without highlights, participants will be asked to add at least one highlight. If there are highlights that are not yet linked to an insight, participants will be asked to review potential connections and group highlights to a new insight. Advanced analysis interface: The advanced interface is open for project admins only, and is accessible through the admin interface (under “Analyze,” when applicable). Admins can go through all unprocessed answers (those not yet linked to at least one approved insight), and they can add, edit, approve, or delete answers, highlights, and insights. 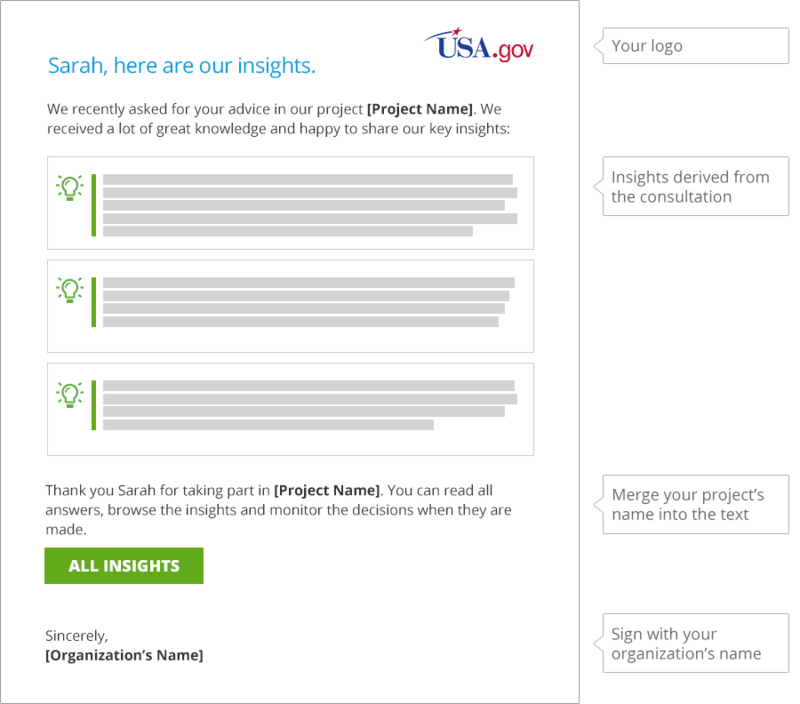 Approve insights interface: The approve interface is open for project admins only, and is accessible through an email invitation or through the admin interface (under “Analyze,” when applicable). Here, admins can edit and delete insights, change their order, and share them as a whole both on the website and via personal emails. Yes. Our team will verify the insights before you will be asked to publish them. Until you approve the insights collectively, they will not be sent to the participants and will not be accessible in the “All Insights” page. Project admins can always edit insights, delete them, or unlink unfavorable highlights (even after the project has closed). Where do the participants perform analytical tasks? After adding an answer, the participants will be asked to perform various tasks such as highlighting their answer, and linking the highlights to an insight. In addition, they will be invited to the task interface, where additional tasks will be presented to them. While participants will mostly process their own answers in the answer flow, they can also help process others’ answers in the task interface. When and how will participants be asked to process answers? After adding an answer, each participant will be asked to perform analytical tasks for the new answer (such as highlighting an important point or linking the highlight to an existing insight). When the number of answers exceeds 20, the participants will be invited to the task interface by a widget on the site. In the interface, they will be asked to analyze others’ answers. Once the project is closed and no new answers can be released, participants may receive an email asking them to perform analytical tasks through the task interface. This email will be sent only if their involvement is needed. What happens if participants are not willing to help with the analysis? This has never been the case. However, if in fact no participants are willing to help after several requests, then the project admins will need to perform the analytical tasks themselves. What happens after an insight is approved? Once an insight is approved, participants can link highlights to it. However, until the project advances to the “Decide” phase and all insights are approved, participants will not be able to see the full list of insights. Yes. You can create several highlights from each answer, and each will be linked to a different insight. It is also possible that two participants will link the same highlight to two different insights. In such cases, the highlight will be linked to two insights only until the person who wrote the answer or a project admin chooses one. What actions can be performed in the advanced analysis interface? Showing content: When you launch the interface, you’ll see unprocessed answers. On the top line, you can change the settings to display all answers or all highlights. Adding highlights: When the answer is presented, you can add a highlight by clicking on the “plus” icon above it. Approving answers, highlights, and insights: If an object is pending approval of an admin, the interface will ask you to approve or delete it. Editing answers, highlights, and insights: By opening the object menu (click on the “^” sign on the top right-hand box), you can easily edit content. Deleting answers, highlights, and insights: By opening the object menu (the “^” sign), you can delete content. Note: this action is irreversible! Linking highlights to insights: After adding a highlight, click on the green button (“Connect to Insight”) to select one of the insights. If the highlight is already linked to an insight, you can replace it with a different insight. Creating new insights: All insights are presented on the right-hand side. You can create a new insight by clicking on the “+” icon at the bottom of the list. What happens when several people are processing answers? To prevent duplications, the website will search for an answer that is not already being processed by others whenever you move to the next answer. After publishing the insights, project admins will be asked to make decisions. This will be explained in the next section. How can I change the order of insights? Is there any quality control of insights before they are published? Can one answer be connected to several insights? Enter the project, go to the admin interface, and click “Analyze” on the left-side menu. Select “Go Through All Answers.” On the top right-hand side (above the insights) click “Change Order.” After you set the new order by dragging the insights up or down, select “Approve.” The new order of insights will be updated.